One of the downsides of having a large music collection is that I sometimes inadvertently overlook excellent albums for years as shiny new obsessions and old faithfuls compete for my attention. On the other hand, that is also what is so great about having an extensive collection. There is real pleasure in rediscovering some fantastic “lost” album among my own stacks. Occasionally I’ll force myself to look through the shelves for something I haven’t heard for a while, but more often the rekindling of the relationship comes about simply by chance. Such was the case recently as I happily renewed my acquaintance with the sophomore album by Montrose, 1974’s Paper Money. We recently bought my wife a car that, among other bells and whistles, has an interactive system that allows you to tune the radio or manipulate a paired cell phone through spoken commands. I have become infatuated with this new toy. Whenever lucky enough to score the fancy ride, I gleefully connect my iPod and demand that the vehicle entertain me. Having the system recognize my call for “Artist: Kvelertak” or seek clarification when I request “Album: 13” — Megadeth or Black Sabbath?? — is a blast. It was in one of these recent moments of audio vehicular (AV) panic that Between the Buttons came spurting out. I had watched a portion of Some Girls: Live in Texas on TV the night before and must have had Rolling Stones on the brain. When the album’s fourth track “Connection” came on I was reminded that I’d always thought of it more as a Montrose vice a Stones tune thanks to the excellent cover version on the Paper Money album. I briefly contemplated making a mix CD of cover versions of Stones songs that I would deem better than the originals, but gave up the thought after initially being able to come up with only one additional example beyond Montrose’s “Connection,” that being the KISS take on “2000 Man.” These ruminations did, however, end up paving the way for Paper Money to become the next demand made of my mobile audio butler, thus leading to my joyful rediscovery. Ronnie Montrose and fellow guitar hero Robin Trower were my most beloved, idolized, and just plain listened-to obsessions during my high school years. Both artists remain very important to me today. In fact, it was Ronnie’s suicide in March 2012 that led me to put to paper the personal thoughts that would become my first blog post. That said, my introduction to Ronnie came via his relatively lesser-known second band Gamma, which then sent me backwards to his first solo album. It was only after logging significant time with those treasures that I eventually made it to his most broadly-recognized and influential earlier work, the 1973 debut from Montrose, the band. As it is with a connoisseur’s (read: addiction-prone) personality, I would eventually come to own all the Montrose, solo Ronnie, and Gamma studio albums, along with a few compilations and live bootlegs. In that mix of roughly 20 options for a Ronnie Montrose fix however, it seems that Paper Money has been the album most prone to falling behind my notional nightstand over the years. It shouldn’t be so given that the album would certainly be in any personal top 10 list of Ronnie Montrose LPs were I inclined toward such rankings. Listening to and enjoying Paper Money repeatedly over these last few days, I think I can now guess at the reasons behind my inadvertent disrespect. It simply gets lost in the wake of that awesome, harder rocking and relatively more cohesive Montrose debut record. 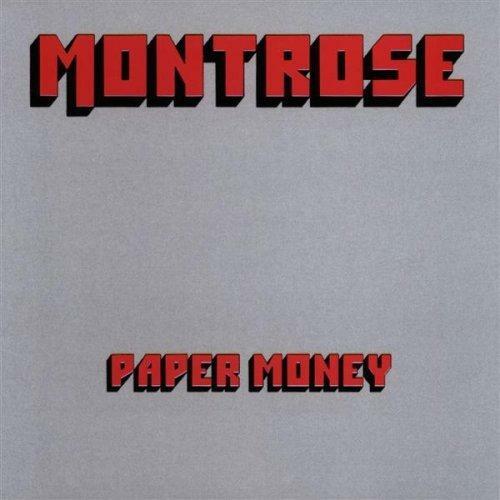 Later Montrose albums, all of which I’d rank below Paper Money if forced, have never really had to compete with the debut LP because, by the time of their releases, Montrose had changed so much in terms of personnel, producers, and overall sound that the later records can be heard almost as products of a different band. This allows them to be enjoyed unencumbered by the yoke of “comparison.” In contrast, Paper Money, with its (near) same band line-up, and especially with those distinctive Sammy Hagar vocals, inevitably invites immediate weighing against its predecessor. And to be blunt, Paper Money doesn’t hold a candle to the debut. As a result, when daddy craves him some “classic” Montrose, the ’73 debut is the obvious choice. Paper Money doesn’t get rejected as much as it simply gets unremembered. Re-remembering Paper Money now has been fantastic. Considering it independently from the debut has allowed me to recapture and reclaim it, so to speak. While the overall sound of the album is decidedly softer than its hard-rocking predecessor, it still boasts one of the hardest and best rockers in the Montrose canon in the song “I Got the Fire.” Title track “Paper Money” is another stomper, riding a funky bass line and hosting some cool, spacey guitar. “The Dreamer” and “Spaceage Sacrifice” are also highlights, both carried along by moody rhythm guitar riffs that are perfectly matched to Sammy’s vocals. Also, as noted above, I really dig “Connection” here and honestly believe the Stones’ original pales in comparison. Were grumbles required, I guess I’d lament the relative lack of Ronnie guitar workouts on Paper Money. However, I’d balance that complaint by arguing that Sammy may not ever have sounded better than he does here. I think the slower pace permits him to demonstrate a greater depth than the amazing, but nonetheless more monochrome vocal performance on the debut. An aside: As a passionate know-it-all teenager, I was very protective of my heroes Robin and Ronnie, believing adamantly that all should acknowledge and bow down to their magnificence. I wrote off anyone who failed to comprehend the pair’s greatness as simply too uncool and uninformed to deserve their divine gifts. So much was my Ronnie worship in particular that, seeing Sammy Hagar in concert in 1981, I was quite upset by his introduction of the songs “Rock Candy” and “Bad Motor Scooter” as being “from (his) previous band.” Montrose was Ronnie’s band damnit and I strongly resented what I then took to be Sammy’s attempt to usurp credit. I have since set such silliness aside, thus allowing myself to recall that Sammy killed on both songs live. Especially cool was seeing Sammy play Bad Motor Scooter’s revving motorcycle riff himself. Amen to that. I agree 100% about the “intensity of the feeling” thing. Too bad I wasn’t there in 1980 or whenever to assist in the preaching by testifying to your friends, ha! What a fine song that is, and largely forgotten, I think. It still breaks my heart to think about Ronnie’s fate. I think it’s cool that his death inspired you to begin blogging. It was turning fifty that did it for me; I started blogging last May. I love finding lost and overlooked treasures in the collection! Great stuff. I’ve only got the Montrose debut and a comp so I only have a few of the Paper Money tunes. I feel a fuller investigation into the rest of Ronnie’s career is overdue! Yeah man, I’m obviously biased as you can tell but I think Ronnie is definitely worth exploration. His solo stuff is pretty varied but there are some real hard-rocking finds in there, with the “intimate live” album Music From Here and The Speed of Sound being two in particular I would have no qualms recommending to you based on my extrapolated sense of your tastes. I’d guess that there are a lot of folk out there who either own or otherwise are aware of the debut but haven’t dipped their toes much further. As you can tell, I’d be a proponent for a deeper wade. I’d imagine such rediscoveries happen in your own “backyard” (shelves) all the time, eh?